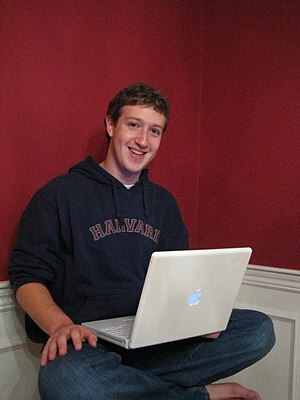 Al parecer, no creo que haya ninguna burbuja para ser vista cuando se trata de Facebook. El fondo de inversión GSV Capital adquirió una pequeña participación en Facebook que valora al sitio de redes sociales más grande del mundo en unos 70.000 millones de dólares (48.944 millones de euros). Considerado durante mucho tiempo uno de los grupos de inversión más estable en Wall Street, la inversión de Goldman tiende a mantener una considerable credibilidad más que el típico “analista” de las valoraciones que hemos visto en el pasado reciente. Por supuesto, esto sigue sin responder a la pregunta de “¿cuándo es la salida a bolsa”?, pero, como señala The Times, añade presión a Facebook para que la oferta deba suceder. Otra pregunta sin respuesta es qué saldrá de las inversiones en acciones antes de la salida a bolsa de la compañía. Como en los EE.UU. la Comisión de Valores ha abierto una investigación sobre las ofertas, la valoración SecondMarket actual es de alrededor de 56 mil $ millones. A medida que Facebook sigue creciendo en popularidad y el tráfico, las siguientes preguntas son acerca del dinero. Usted puede estar seguro de que The Next Web tendrá todos los detalles de como estén disponibles, y un montón de conjeturas, incluso antes de esa fecha. Siéntase libre de utilizar el gráfico en su propio blog, pero por favor enlace aquí. Gracias. 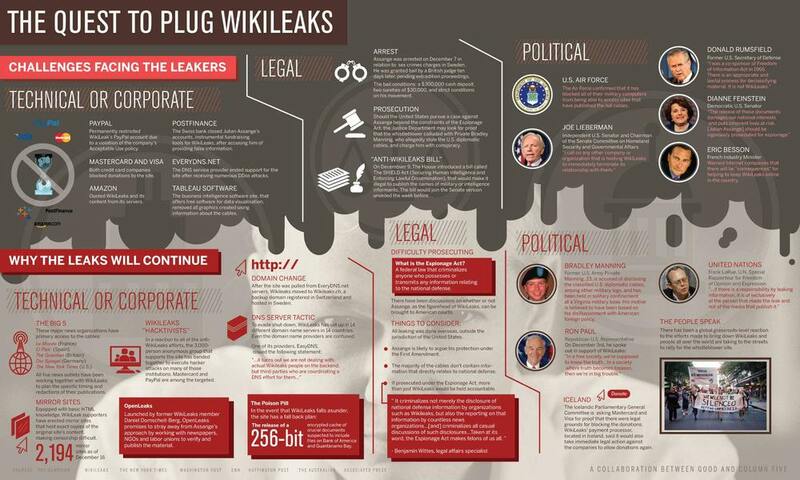 5 Infografías: ¿Qué viene después de Wikileaks? 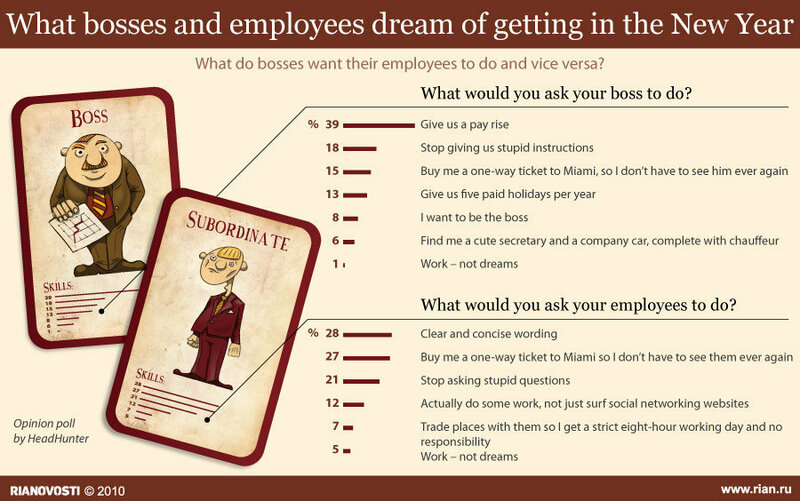 ¿Qué sueños tienen los jefes y empleados para conseguir en el Año Nuevo? ¿Qué viene después de Wikileaks? Esta divertida infografía muestra cumplidamente los pesos de las fuentes Helvética en los géneros de la música rock hecha por sixrevisions.com. Tiene un doble propósito de servir como Trucos ingeniosos para los pesos de la fuente Helvética. Usted puede ver “el verdadero tamaño de África” tamaño inesperado relativo de África en comparación con un grupo de países. 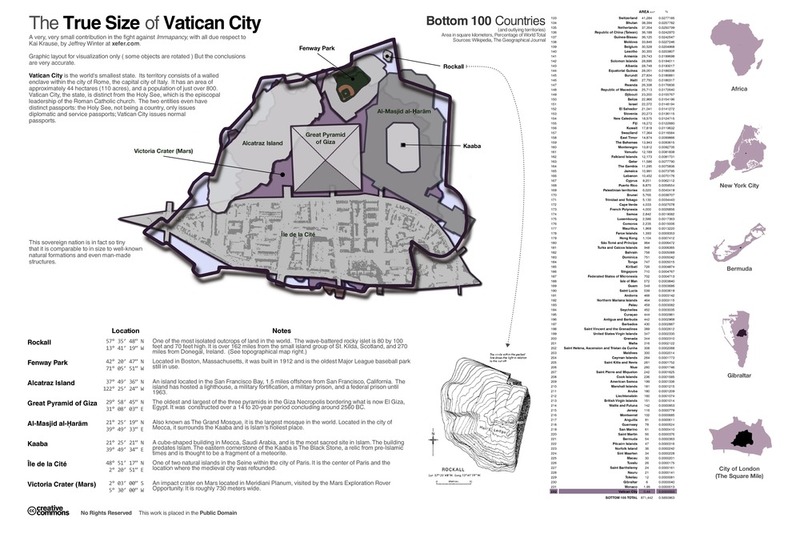 Este gráfico similar del estado soberano más pequeño del mundo, la Ciudad del Vaticano, un país de menos de un kilómetro cuadrado de superficie. Con las condiciones de cambio climático en el futuro, debido al aumento de las concentraciones de dióxido de carbono en la atmósfera, las condiciones para las plagas también cambian. 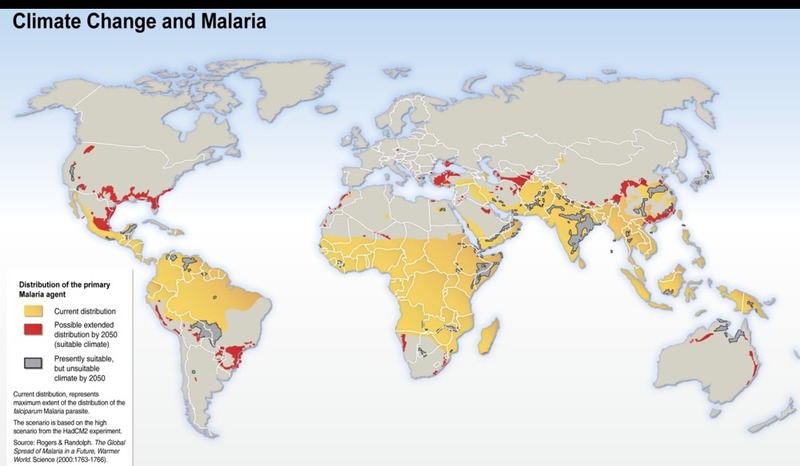 El principal agente de la malaria, el parásito de la malaria por Plasmodium falciparum, será capaz de extenderse a nuevas áreas, como se muestra en este mapa, para el año 2050 utilizando el escenario Hadley CM2 alta. Otras áreas, no aparecen en el mapa, será inhabitable por el parásito, y por lo tanto libre de la plaga. Tenga en cuenta: Si lee esto por correo electrónico o haga clic en el Enlace Feed-lector permanente a continuación para descargar la imagen más grande. Algunos migrantes 192m 3% de la población mundial enviaron remesas por un total de 316 mil millones dólares a países en desarrollo el año pasado, según el Banco Mundial. El costo del envío de remesas se correlaciona negativamente con el número de migrantes y proveedores de servicios en un país, la mayor competencia, menor será el costo. esta tabla muestra, para cada país, que es el país más caro para enviar $ 200 a.
Tenga en cuenta: Si lee esto por correo electrónico o haga clic en Feed-lector Enlace permanente a continuación para descargar la imagen más grande. 44% de la población total de Twitter se unió entre enero 2009 y agosto 2010. 82% de los usuarios de Twitter ahora un nombre, en comparación con el 33% en 2009. 73% de ofrecer información de ubicación, frente al 44% en 2009. 63,3% ofrecen ahora una biografía, en comparación con el 31% en 2009. 45% de los usuarios de presentar una dirección del sitio Web, en comparación con el 22% en 2009. 80.6% han hecho menos de 500 tweets. 22.5% han representado alrededor del 90% de toda la actividad. Los usuarios con más de 100 amigos ha aumentado en tres veces al 21% desde 2009. Justin Bieber, es una de las mejores frases de dos palabras y el nombre arriba en la BIOS del usuario. How Do I Become President? How Do Couples Divide Their Money? Eleven examples of man made highness compared to some other well-known tall structures. This infographic made by Erik Wiegers graphic designer and conceptcreator from Netherlands. If you like what you see, you can find more work of Erik Wiegers on the http://www.behance.net/erikwiegers. 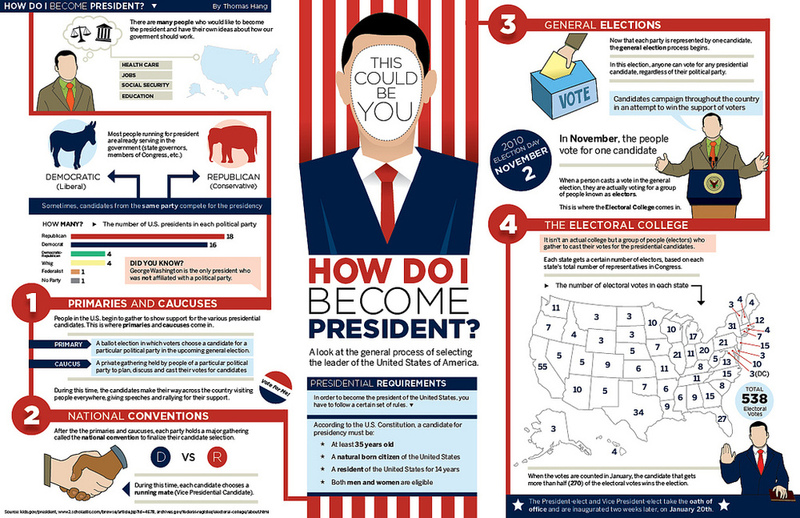 An infographic detailing the presidential selection process in the United States. Submitted into the “How Do I Become President?” Challenge ( challenge.gov ). Few topics ignite as much curiosity and passionate discourse as that of handling money in a relationship. Should couples merge all their finances, or should they take a “mine, yours and ours” approach? How large of a purchase can you make without discussing it with your partner in advance? Should you merge credit cards? To get a better idea of how couples throughout the country perceive their financial lives and how they manage their joint money, see mint.com infographic. 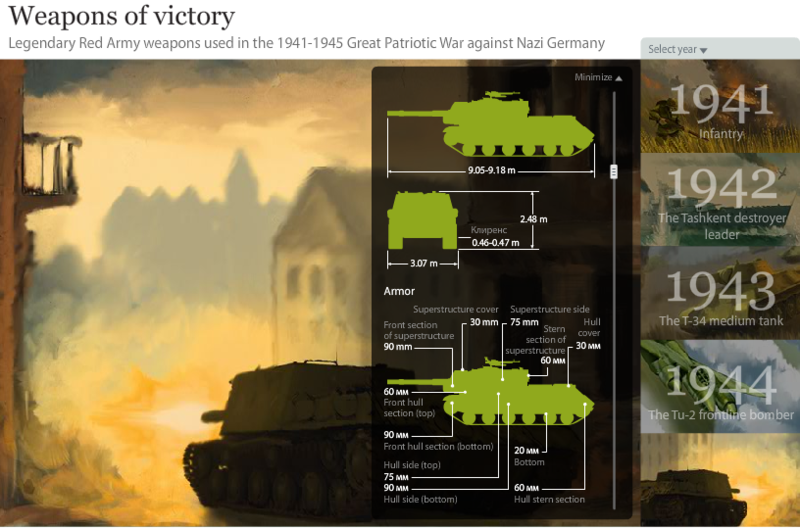 Legendary Red Army weapons used in the 1941-1945 Great Patriotic War against Nazi Germany. Proper diet and nutrition are key to children’s well-being, keeping them healthy and supporting cognitive development. A diet without nutrients like iron or folic acid can have serious effects. But in the developing world, the correct nutrients aren’t always in children’s diets. 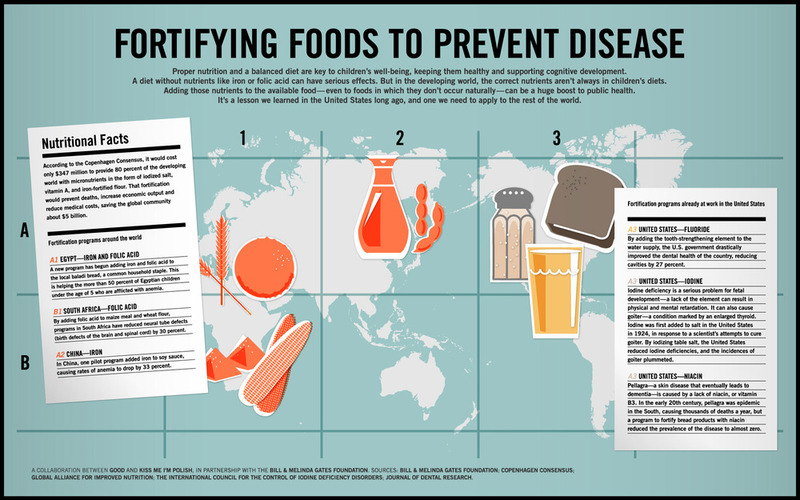 Adding those nutrients to the available food—even to foods in which they don’t naturally occur—can be a huge boost to public health. It’s a lesson we learned in the United States long ago, and one we need to apply to the rest of the world. Federal funding for basic science, including stem-cell research and climate-change initiatives, could hinge on what happens in the new House of Representatives, which will be controlled by the Republicans. However, if the past is any guide, dollars allocated for science will transcend both politics and the economy. 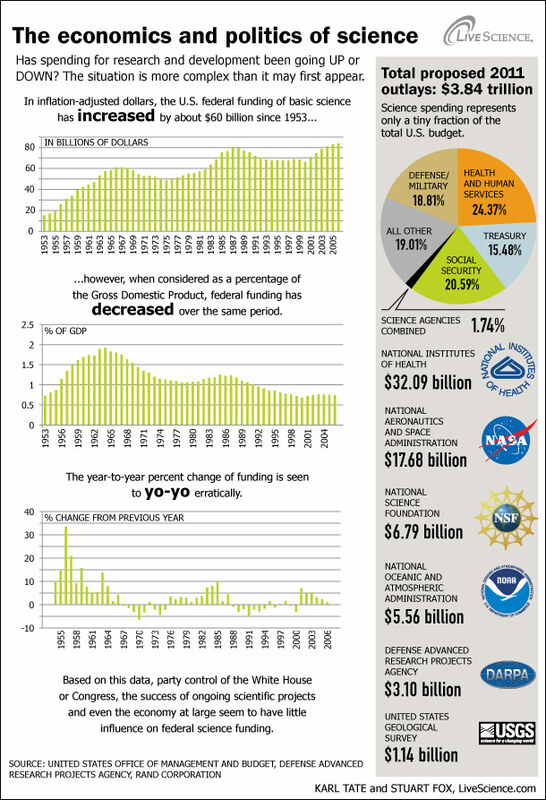 Here’s a look at science funding over the years made by Karl Tate from livescience.com. 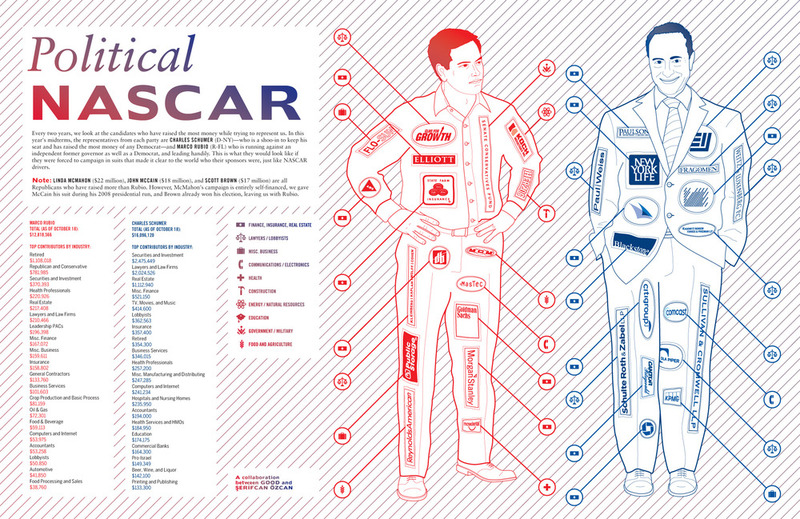 This infographic designed by Gareth Parry from Auckland, New Zealand. 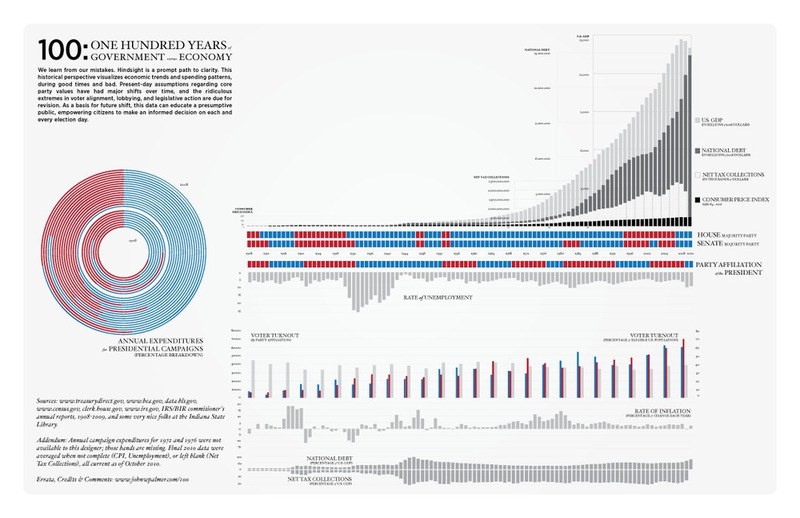 He plan to make 52 infographics in 52 weeks. This (17th week) week’s challenge Make an infographic about energy. 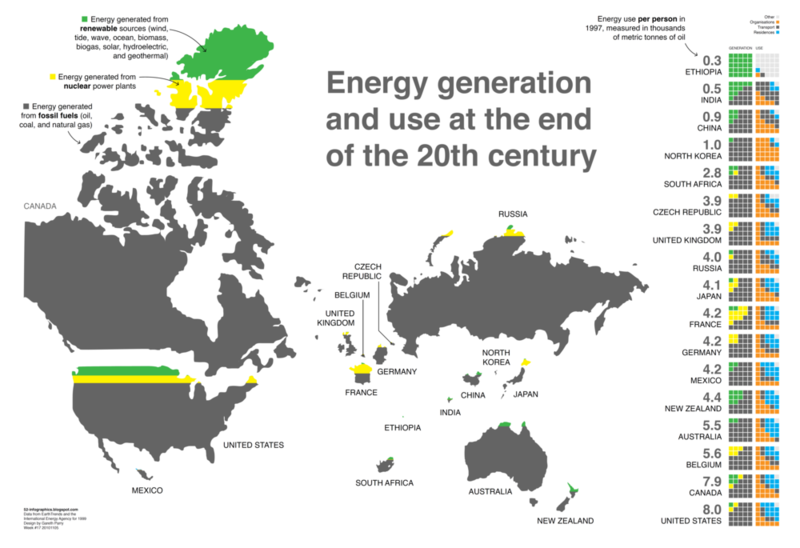 This infographic answers: Where was our energy generated at the end of last millennium? How did we use it? When it comes to The Great Recession, there are plenty of cities that are recovering nicely from the economic slump and those that have completely missed the boat. Which Actors Have Died the Most? Do the biggest box office failures lose a few million? Ten million? More? Much more. The billionaires on the Forbes 400 list have given more than $30 million to politicians and political action committees since 2006, along with millions more in soft money to politically active groups. Although Forbes 400 members give about 15% more money to Republicans than Democrats, they fund groups across the political spectrum. Every two years, good.is look at the candidates who have raised the most money while trying to represent us. In this year’s midterms, the representatives from each party are Charles Schumer (D-NY)—who is a shoo-in to keep his seat and has raised the most money of any Democrat—and Marco Rubio (R-FL) who is running against an independent former governor as well as a Democrat, and leading handily. This is what they would look like if they were forced to campaign in suits that made it clear to the world who their sponsors were, just like NASCAR drivers. Here Lies 15 of Hollywood’s Most Killed Stars. Robert De Niro has died in 14 films which include: Bloody Mama, Bang the Drum Slowly, Mean Streets, Brazil, The Mission, Cape Fear, This Boy’s Life, Mary Shelley’s Frankenstein , Heat, The Fan, Jackie Brown, Great Expectations, 15 Minutes and Hide & Seek. How does the British economy benefit from the Internet? How Do Americans Feel About The Recession? How do you measure the effects of the internet on the economy? A Google funded report published today answers this question and concludes the internet business in the UK made £100 billion in 2009. Tableau Software is the leading provider of fast analytics and data visualization software. Tableau Public visualizations have been viewed more than 7.5 million times since our February launch. That viewership is a direct result of talented and creative authors. 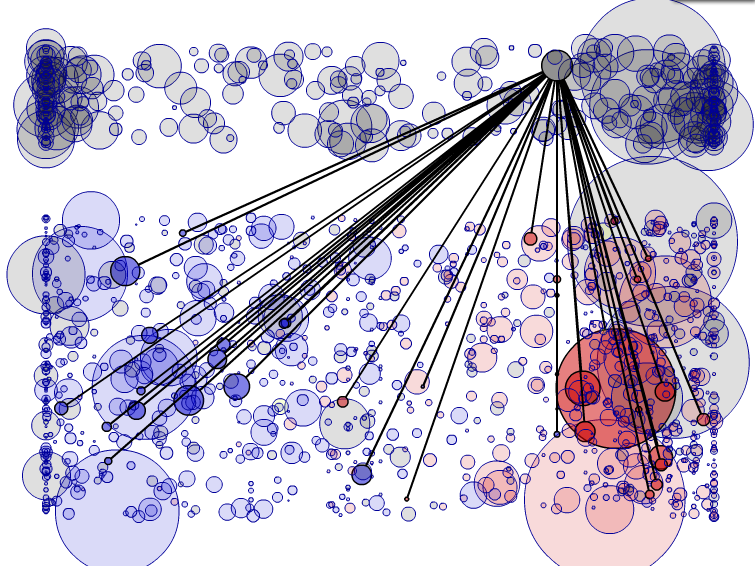 To celebrate those authors and their vizes, they have made their own visualization, showing the top 100 Tableau Public views by traffic in Q3 of 2010. Take a look and as always,interactive! Do you know how the internet really works — how you’re able to read this article on a magical glowing rectangle attached to a keyboard? This cheat sheet created by flowchart guru Doogie Horner explain the inner workings of the web to someone even less informed. Earlier this year, the National Bureau of Economic Research delivered a piece of news that came as a surprise to most Americans: the recession, it determined, had officially ended in June 2009. At a total of 18 months, it now has dubious honor of being the longest U.S. recession since the Great Depression. But how do Americans feel about it? Do the millions unemployed individuals feel like it really is over? And how do people – employed and unemployed – feel about its aftermath? mint.com compiled the answers those questions, and more, in their latest infographic. How does our diet affect the planet? And how do some of the different diets around the world compare? The Empire State really is something. The communities in New York have been doing remarkable things through the Pepsi Refresh Project, from major school improvements to veterans’ support, and everything in between. Here’s a look at some the amazing things New Yorkers have done to make their wold a better place. A massive data visualization tool that lets users find out how the U.S. economy is performing, including breakouts on jobs, house prices, inflation and income. The visualization was designed & developed by the editorial multimedia team of CQ-Roll Call Group, the premier political news and information provider covering congress. The data is collected from government and non-government sources; the interactive shows all historical data and is updated live as new data is released. It also features a glossary with sources and descriptions of the data and the data is available for download in Excel format. We think it’s the first interactive tool of its kind to pair up this much national and regional/state data side-by-side. It’s hooked up to a database and was built in Flash. All of the components, including the graphing and mapping portions, were custom built and are fully reusable APIs.